5/30 Cup of Coffee: Only two of the six scheduled contests on Tuesday's docket ended up going forward, with doubleheaders in Salem and Greenville both getting rained out. 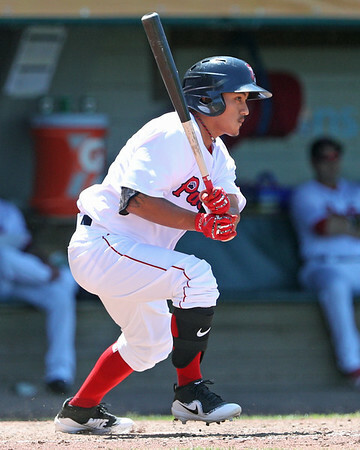 Power from Tzu-Wei Lin (pictured) and Rusney Castillo supported the reliably solid Justin Haley in the Pawtucket win. The PawSox wasted no time jumping out front when Tzu-Wei Lin led off the game with a solo home run. Three batters later, Rusney Castillo blasted a two-run shot, his first of the season. That outburst would be all the run support that Justin Haley would need, as the righty allowed one run on five hits over seven innings. Haley struck out six without issuing a walk, continuing his run as one of Pawtucket's most reliable starters. He has allowed two or fewer runs in eight of his 10 starts on the season. Lin added another single, walk, and run scored, before leaving the game in the fourth inning. Castillo also added a second base hit, while Cole Sturgeon was 2 for 5 with his third double since his promotion from Portland and 12th overall on the year. It was a tough evening in Manchester, as the powerful Fisher Cat lineup had its way with Teddy Stankiewicz. The Sea Dogs starter allowed seven runs on 11 hits, including a two-run blast to the white-hot Vlad Guerrero Jr. A bright spot for Portland was the solo home run in the first inning off the bat of Josh Ockimey. After battling injuries for much of April, Ockimey has posted a .290/.415/.520 line in May. Persistent rain interfered with the scheduled doubleheader at Haley Toyota Field. The teams will try instead to play doubleheaders on both Wednesday and Thursday. The rain also led to a pair of postponements in Greenville, where the Drive and GreenJackets were going to attempt to complete their May 20 contest before their regularly-scheduled affair. The teams will attempt to finish the suspended game on Wednesday followed by a true doubleheader on Thursday. Player of the Day: Tzu-Wei Lin left Tuesday contest after just four innings, but that was plenty of time for him to make a major impact. Getting the start at second base, Lin delivered his second homer of the year, followed by a single, walk, and run scored. It was the third consecutive two-hit game for Lin, who has raised his batting average 40 points in that time.